Unfolded length of Kubey KU-099 is about 8.3 inches, the blade is 3.6 inches. Modern classic is the knife with drop-point blade and straight sharpening. Kubey KU-099 will be enjoyed by both tourists and hunters, hikers and fishermen. Excellent-quality alloy 8Cr13Mov stainless steel (resistant to corrosion, edge retention and toughness) was selected as the blade material. Its hardness is 57-58 units on Rockwell scale allowing to satify most conditions and environment of use. The G10 handle, It has a textured surface and allows to keep the knife as comfortably as possible even under adverse conditions. 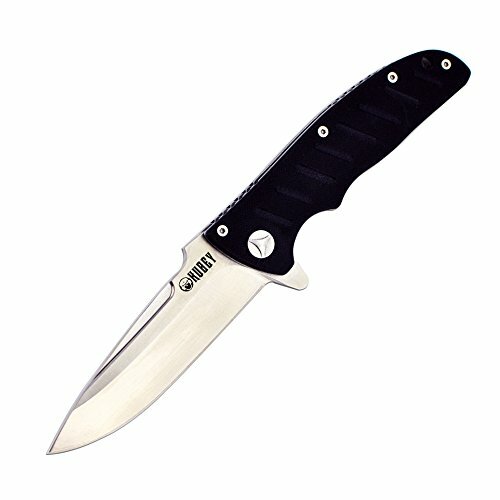 Built in Flipper pivot, Tactical folding pocket knife offers single hand smooth opening.Kubey professional outdoor camping knives, our knives fully qualified, it is an excellent choice for outdoor fancier.